Been diving in Mabul? Please Vote! Scuba divers have always flocked to the island of Sipadan for fantastic diving opportunities, especially when it comes to large pelagic sightings amidst beautiful hard and soft corals. However, in recent years it is the smaller and lesser-visited neighbouring islands that have received much attention, and for good reason! One of these islands is Mabul Island, or Pulau Mabul as it is locally known. Although it is unlikely to offer regular pelagic sightings (except for turtles), the dive sites around Mabul Island offer something entirely different – muck diving at its finest. In fact, it is believed that the term ‘muck diving’ was actually coined in Mabul thanks to the huge variety of macro life available. Although only a 25 minute boat ride from the island of Sipadan, Mabul offers great contrasts from the size of the marine species to the underwater landscape. Whereas Sipadan boasts deep walls, long and colourful coral reefs and plenty of larger fish, Mabul has a sandy ocean floor that hides a multitude of tiny and interesting-looking creatures. Now a major diving destination completely independent of neighbouring Sipadan, above the water’s surface Mabul is a small sandy island that is home to palm trees, a quaint fishing village and the relatively recent addition of many dive resorts. As a macro diver’s paradise and a superb location for macro underwater photographers, Mabul’s underwater scene is truly mysterious and magical. All sorts of weird and wonderful-looking critters and creatures can be found hiding in the sandy ocean floor or in the rubble caused by broken coral, rocks and more. Without question, Mabul is one of the finest destinations for spotting a huge variety of small exotic marine life, and is one of the world’s best muck diving destinations. If you’re really looking to make the most of your visit to Malaysia, you would opt to dive at both Sipadan and Mabul island and experience everything that these fantastic locations have to offer. Whilst Sipadan is famous for large pelagics and large schools of fish often many thousands-strong, Mabul presents plenty of smaller, odd-looking creatures such as the flamboyant cuttlefish, nudibranchs, mimic octopi and harlequin shrimp. With over 10 scuba diving spots surrounding the small island of Mabul, divers are spoilt for choice across this 2 kilometre square area of macro diving bliss. The most famous sites at Mabul include the Seaventure Platform, the Coral Reef Garden and the Paradise sites. As it may be simple to guess from these aptly named sites, the Paradise sites are certainly a joy to behold for macro diving enthusiasts. These dive sites rarely fail to impress divers from all over the world and are a firm favourite amongst dive tour companies. The reefs are actually the house reefs of two resorts, the Sipadan Water Village Resort and Borneo Divers Mabul, as they are easily accessible from these resorts. Paradise 1 offers plenty to see and is an exceptionally easy dive at only 9-15 metres. Directly accessible from the Dive Centre on Sipadan Water Village Resort, Paradise 1 can be a very exciting dive, especially as blue-spotted mask rays and Whiptail rays are regularly spotted resting just under the sandy bottom of the ocean floor. Paradise 1 also boasts a forest of rich and healthy coral species, adding to the beauty of this site. Paradise 2 also has an array of healthy coral, however staghorn coral is more prevalent here than on Paradise 1. For those with a keen eye, it might be possible to spot the brightly coloured mandarin fish hiding amongst the horns of the staghorn coral. Both sites can also be dived at night, and thanks to their close proximity to the island’s resorts, these night dive opportunities are completely hassle-free. Borneo Divers is a well-established resort that started in Mabul in 2003. It has since adopted Paradise 2 as its house reef and has made numerous efforts to maintain and sustain this beautiful site right off the resort’s jetty. Joining forces with local authorities, the resort has created a successful Adopt-a-Coral program and has planted a number of artificial coral and sea-grasses to conserve the valuable reef. These conservation efforts seem to be working, as Paradise 2 is teaming with life including larger species such as sea turtles, moray eels and bamboo sharks, but also boasting smaller life such as nudibranchs, squat lobsters, harlequin shrimp and leaf fish. 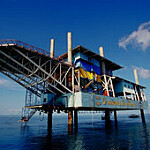 The Seaventure Platform is an old oil rig that now forms one of the most popular dive sites in Mabul. Just a short 5 minute boat ride from Mabul Island and well-protected from the strong currents, Seaventure Platform is ideal for muck diving enthusiasts looking to get their muck diving fix. With plenty opportunity to explore the macro life in and around this wrecked oil rig, this site is one of the best Mabul has to offer. A major highlight for many divers are the large moray eels that now call this oil rig home – they can grow to an impressive 3 metres long in this area and will always be the talk of the dive if divers manage to spot them. Other highlights include ghost pipefish, nudibranchs, pygmy seahorses, lionfish and frogfish in every colour. This site boasts fantastic sightings of colourful nudibranchs, seahorses, crabs and shrimp, not to mention the stunning coral species that lie in these shallow waters. The Coral Reef Garden site is hugely popular with beginner and experienced muck divers and with its convenient location just east of Mabul is an easy reef to explore and enjoy. Lobster Wall is one of the deeper dives around Mabul, but is still quite shallow at only 20 metres at its deepest point. This colourful reef consists of a gently sloping wall covered in all sorts of marine life including nudibranchs and various pipefish species. The wall has numerous small holes which lead beyond the wall to a series of tunnels, and it is here that the dive site gets its name as there are often lobsters in the entrances to these small caverns. For macro-divers, sites such as Crocodile Avenue are what it’s all about, however for many adrenaline-seeking divers, these sites can seem rather mild. For those who are keen on actively searching for their kicks and getting them from unique and interesting species that one might usually miss on a normal dive site, Crocodile Avenue comes highly recommended and will easily satisfy any diver’s need for the unusual. Froggy Lair is another site around Mabul that requires divers to keep their eyes focused on seeing what is not easily seen such as critters and macro species, some of which are truly unique and not easily found elsewhere. This site is accessible by boat from Mabul Island and is a great site well-suited for any age group or experience level. The gentle slope of this reef makes for an enjoyable dive and will allow divers to see plenty of underwater life in every size, shape and colour. The marine life in Mabul is varied, interesting and wonderful. 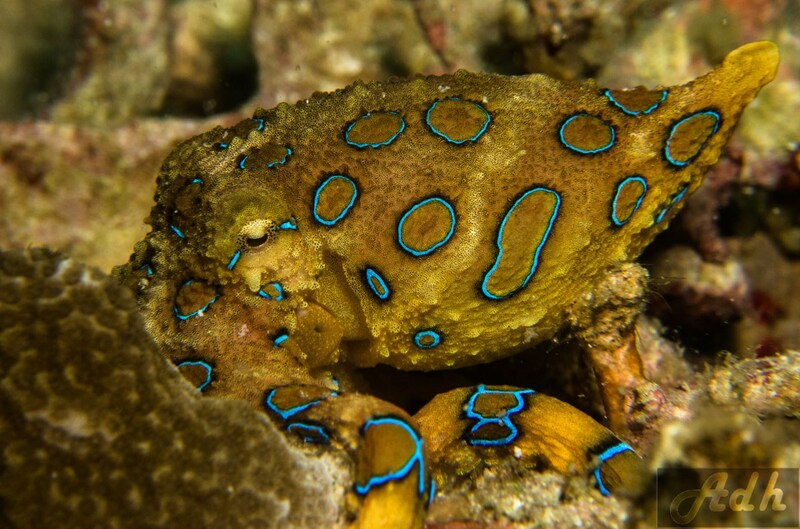 To start, the reefs and sandy areas surrounding Mabul offer some of the most magnificent cephalopods such as the vibrant flamboyant cuttlefish, the rare mimic octopus, bobtail squids and the blue-ringed octopus. There are also an abundance of frogfish to be seen in Mabul such as the giant frogfish, the clown frogfish and the painted frogfish. Mabul is crawling with all sorts of crustaceans too such as the mantis shrimp, harlequin shrimp, spider and porcelain crabs and hairy squat lobsters hiding out in secret holes. Divers are also able to spot sweet pygmy seahorses, harlequin ghost pipefish, crocodile fish, leaf scorpion fish and even dwarf lionfish. As if that wasn’t enough to satisfy even the most experienced and difficult-to-please macro diver, Mabul also boasts devil scorpionfish, well-hidden stonefish, stargazers and flying gurnards with their interesting-looking wings. With such an abundance of fantastic marine life on offer, divers will be pleased to note that diving is possible at any time of year in Mabul. Although visibility is at its absolute best during the dry season (from March through to October), divers opting for Mabul are often looking to get up close and personal with the array of critters and creepy crawlers on the ocean floor, so perfect visibility is not always of primary concern. Visibility is more of an issue when diving around Sipadan and looking to spot larger pelagics in the distance, so divers should try to avoid the rainy season for ideal visibility for this region. Visibility is unlikely to go beyond 5-15 metres, but with so many marine species to spot, it will be the least of your concerns. Although conditions are rarely unpleasant or rough, divers may experience choppy conditions on the surface of the water from time to time before submerging. Beginners, intermediate and advanced divers are all able to enjoy the 12 dive sites of Mabul as the sites only reach depths of between 5-20 metres. Underwater photographers, especially those with an interest in macro photography, will not be short of fantastic macro subjects in Mabul. Water temperatures are mild to warm for most of the year, with average water tempertures in Mabul staying around 27-30°C. If you are not a fan of such warm waters you may wish to visit during November, December, January or February when the water is slightly cooler. Diving in Mabul can be arranged from both a liveaboard, the MV Celebes Explorer, or from any of the nearby resorts on the islands. Situated only 12 kilometres north of Sipadan and an even closer 5 kilometres west of Kapalai, Mabul is in an ideal location for diving at any and all of these areas. Diving is certainly one of the main activities for Mabul visitors to enjoy, however there are a few other activities for non-divers, or for those divers looking for some top-side activities too. From the many resorts on Mabul, visitors can enjoy ocean kayaking, swimming and snorkelling, or can just relax on the small, sandy island away from the crowds. Visitors can also choose to explore the local fishing villages, play badminton or beach soccer or simply relax by the resort’s pools. Snorkelling is very popular in Mabul and can be done easily right off the dive resort jetties. To experience even more snorkelling fun, some visitors opt to arrange a charter boat to take them to the best snorkelling spots. With calm conditions and shallow waters, snorkelling in Mabul is easy. Although many visitors flock to the world-famous Sipadan Island for accommodation, Mabul is fast-becoming a fantastic option for accommodation thanks to the many dive resorts available. Suitable for any budget, Mabul boasts large and luxurious dive resorts as well as comfortable yet inexpensive options too. Certain times of the year are likely to be busier than others, so it is highly recommended that you book in advance, especially if you are choosing to travel over Christmas, New Year or Chinese New Year. Popular months are also between March and August. Divers staying on Mabul Island often choose to explore both Sipadan and Mabul dive sites, however your best bet of obtaining a permit is to stay for as long as possible, usually at least 5 nights and 6 days. This is because each resort only receives a certain number of allocated Sipadan permits per day. For example, the Sipadan Mabul Resort and the Mabul Water Bungalows share 14 dive permits between them per day. If you are unable to stay in Mabul for at least 5 nights and 6 days, you might try to obtain any unused permits, however this is not guaranteed. For expats, Singaporeans and Malaysians with work permits, special local rates are available. Found on the southern tip of Mabul, the Sipadan-Mabul Resort offers an enjoyable, comfortable stay with plenty to do both above and below the water. With a host of fun, organized activities, a great beach and direct and easy access to some of the world’s best dive sites, staying at the Sipadan-Mabul Resort is a great option for divers. There are 45 homely chalets on the resort offering up to 90 people to stay on a twin-share basis. The resort will happily arrange transfers to Kapalai Island, Si Amil Island and Sipadan Island for those with Sipadan permits. The Sipadan-Mabul Resort shares its 14 daily permits with Mabul Water Bungalows, which means that visitors staying here will be near-guaranteed at least one visit to Sipadan Island if staying longer than 6 days and 5 nights in a stand-alone chalet or suite. If staying in a semi-detached chalet, Sipadan Island permits are distributed on a case-by-case basis and only when available, so unfortunately there is no way to guarantee that semi-detached chalet dwellers will visit Sipadan Island during their stay. If unallocated permits are available, visitors may pre-book these permits for a fee, however, these permits will only be confirmed around 1 week of your arrival date. The luxurious floating dive-resort known as Mabul Water Bungalows offers a range of 15 wooden bungalow suites on Mabul Island. Regardless of whether you choose to stay in the Bougain Villa Suite, one of the three Borneo Villa Suites or the Royale Villa Suite, visitors are sure to enjoy their stay in these comfortable bungalows situated right over the water. Eight of the bungalows offer double beds, whilst the other seven bungalows share twin beds. Located just a 15 minute boat ride away from the island of Sipadan, staying in the Mabul Water Bungalows is an experience all on its own. For those staying fewer than 6 nights at Mabul Water Bungalows, Sipdan permits will only be allocated if there are any unused permits. Mabul Water Bungalows will assist visitors with arranging transportation to Sipadan, Kapalai and Si Amil Islands which are all nearby. As one of the longest established resorts in Sabah, it is clear why Borneo Divers Mabul Resort is such a popular choice. Families, divers and non-divers are easily catered for thanks to a host of activities on offer. Not only are there wonderful activities both above and below the water, the resort also offers trips to the local islands of Si Amil, Kapalai and Sipadan. The resort boasts 30 units complete with private verandahs and semi-detached rooms. A stunning beach and the gorgeous Celebes Sea are only footsteps away, and many visitors choose to take advantage of this picture-perfect scene to relax and unwind. Borneo Divers Mabul Resort has 14 Sipadan permits available each day, which means that visitors staying at least 4 nights and 5 days will have a chance of visiting Sipadan, with its fantastic diving that is now world-famous. Additional permits are available for a fee, although as always these are limited and subject to availability. Another fantastic resort on stilts is the Sipadan Kapalai Dive Resort, the only resort on the island of Kapalai. Famed for its many wooden walkways that connect the 59 stilted chalets, this resort is a luxurious and modern getaway ideal for those wishing to explore the diving in and around Kapali, Sipadan and Mabul. Combining dives at these 3 islands means that you’ll be getting the best of the best: fantastic pelagic encounters and world-class muck diving opportunities. This resort boasts good technology, with satellite phones and internet access. Fresh water is also easily accessible from the mainland nearby. For those visitors looking for something truly unique, the Seaventures Dive Rig is certainly worth a look. This converted oil platform is now a modern, comfortable accommodation option for divers looking to enjoy all of the top notch diving that this area has to offer. Seaventures Dive Rig offers unlimited dives at their house reef as well as conveniently packaged boat dive deals to Sipadan, Kapalai and Mabul. The Seaventures Dive Rig is allocated 11 permits on a daily basis, which means that you need only stay 3 nights and 4 days to be certain of a visit to Sipadan at least once during your stay. The Sipadan Water Village Resort offers beautiful, rustic-looking accommodation right over the stunning light blue waters around Mabul Island. Built on stilts and boasting fantastic facilities including a top-class dive centre and stunning dining area, each of the 45 guest cottages is sure to impress. This resort receives 14 permits per day for Sipadan Island. For guests staying longer than 6 days and 5 nights at the Sipadan Water Village Resort, you will be guaranteed at least one visit to the world-famous and highly-protected Sipadan Island. If your stay will be shorter than 6 days and 5 nights, it may still be possible to obtain a Sipadan permit, however this will depend on whether other guests have not used up the 14 permits on the day. The Sipadan Water Village Resort will also make arrangements for guests to visit the nearby Kapalai Island as well as Sipadan Island for those with permits. There is only one liveaboard in this area of the Coral Triangle, and this docks at Mabul Island every night. The MV Celebes Explorer is best suited for diving passengers wishing to dive at Sipadan Island and the surrounding sites every day, and with a top speed of 10 knots, the MV Celebes Explorer is the best way to get the most diving out of every day. At 29 metres long, the MV Celebes Explorer can host up to 16 guests in Standard Cabins or Queen Cabins. The only difference between the Standard and Queen cabins is the bed arrangement: Standard cabins have a bunk bed setup with a single bed at the top and a double bed at the bottom whereas the Queen Cabins have a double bed. Although the facilities are quite basic, the main focus is cramming in as many dives at world-famous Sipadan Island as possible, so divers don’t spend too much time on the vessel itself. The best thing about staying aboard the MV Celebes Explorer is that you will be able to dive at Sipadan Island every day! With 13 permits available each day and a maximum of 16 guests on board at any one time, divers are able to experience the sheer wonder of Sipadan more than any other accommodation option. The MV Celebes Explorer picks up divers on Sundays or Wednesdays and begins its route at Semporna on a Monday. During the day the liveaboard is around Sipadan Island, giving divers access to this fantastic diving location with all that it has to offer. The vessel docks at Mabul Island each night and only returns to Semporna town on Saturdays. For guests arriving on a Sunday, it is easy to board the MV Celebes Explorer at Semporna town and begin your Coral Triangle liveaboard experience on the Monday. For those arriving on a Wednesday, it is necessary to catch a 45-minute speedboat ride to the MV Celebes Explorer at Sipadan Island. The MV Celebes Explorer caters for divers, and has an on-board tank filling station for added convenience. An air-conditioned lounge and dining area is available for guests to hang out, share dive stories and use the Interenet, although the Internet is not always entirely reliable in this part of the world. Although Mabul is not the easiest destination to get to, it promises to be well-worth the effort once you arrive. The closest town is Semporna, located on the eastern coast of Sabah in Malaysian Borneo. It is likely that you will have to make a stop at Kota Kinabalu, but this depends entirely on where your original destination is. From Kota Kinabalu, a quick 40-minute flight is required to reach Tawau airport. These flights can be arranged with Malaysian Airlines or Air Asia. It is also possible to fly from Kuala Lumpur with these low cost airlines, and flight time to Tawau is around 2.5 hours from here. Once in Tawau, your Mabul resort will arrange a transfer to the town of Semporna which is about 90 minutes away. From there, a fast boat will get you to the island of Mabul in 45 minutes, and then it’s time for the magnificent muck diving to begin! To avoid having to stay overnight in Semporna or Tawau, it is best to arrive at Tawau airport before 3pm in order to get the island transfer on the same day. Although most resorts accept major credit cards, Mabul offers no ATMs so it is best to bring enough cash with you for the duration of your stay. The small island of Mabul does not have any roads or cars and is easy enough to explore by foot. Unfortunately, there is a fair amount of trash present in the waters surrounding Mabul as a result of the local fishing villages nearby. Many of the luxury resorts are far enough away that this does not affect swimmers, snorkelers and divers too much. Feeling inspired and raring to go? Check out our Mabul travel guide and start planning your next diving trip!